THE PROBLEM: There is broad consensus today regarding the inability of the current health care system and the dominant fee for service (FFS) payment approach to make progress toward the triple aim of: 1) improving population health, 2) enhancing outcomes and the overall patient experience, and 3) reducing the per capita cost of care. The Centers for Medicaid and Medicare Services (CMS) along with many other public and private entities have invested billions of dollars in recent years to pilot and evaluate various reforms. The Delivery System Reform Incentive Payment (DSRIP) program is one of CMS’ leading initiatives and has allowed a handful of states to develop a broader population health approach as well as to focus on critical improvements in system infrastructure (i.e., HIT/HIE, workforce training, and technology), system redesign (team-based care, care coordination activities, and service integration), and clinical outcomes (i.e., refinement of clinical protocols, quality improvement systems, and pay-for-performance incentive programs). The overriding goal of DSRIP is to improve overall health status and reduce inappropriate hospital utilization. 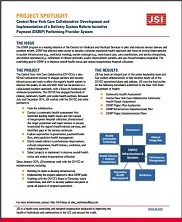 THE PROJECT: JSI has worked with the Central New York Care Collaborative (CNYCC) and its major hospital partners for more than a year to assist them in planning for, implementing, and managing all aspects of their DSRIP initiative. The CNYCC is a new 501 (c) 3 corporation created to engage all necessary partners and develop the critical infrastructure and tools that would allow the region's health system to improve the quality of care and shift from FFS to a value-based approach to payment, particularly targeted at those who are Medicaid-insured or uninsured. The CNYCC has engaged hundreds of clinical, community health, and public health partners spanning all categories of service. 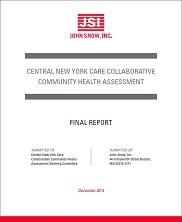 Between July and September 2014, the JSI team worked with the CNYCC to form the collaborative and conduct a comprehensive community health assessment that: 1) identified leading health issues and the root causes of inappropriate hospital utilization, 2) characterized the target population and clarified their major barriers to access, and 3) inventoried the region’s health-related services and identified gaps in the service continuum. Between October and December 2014, JSI worked with the CNYCC and other consultants to explore various governance, payment/funds flow, and population health management approaches, as well as to clarify needs related to performance improvement, cultural competence, health literacy, workforce, and clinical integration. In this period, JSI also assisted the CNYCC in digesting the findings from the community needs assessment and selecting the specific projects that the CNYCC would implement to address the issues identified, improve overall health status and reduce inappropriate utilization. This planning work culminated in the CNYCC’s DSRIP Project Plan Application, due in December 2014. Since January 2015, JSI has worked with the CNYCC to refine its plans with respect to infrastructure development (HIT/HIE, cultural competence/health literacy, workforce training, etc.) and has created Project Implementation Collaboratives for each of the 11 projects charged with developing the implementation plan, as well as helped to convene workgroups for workforce training and cultural competence/health literacy.